help! i’m trying to generate some extra income in my etsy shop, and i’ve been working on some prototypes. will you be my focus group? 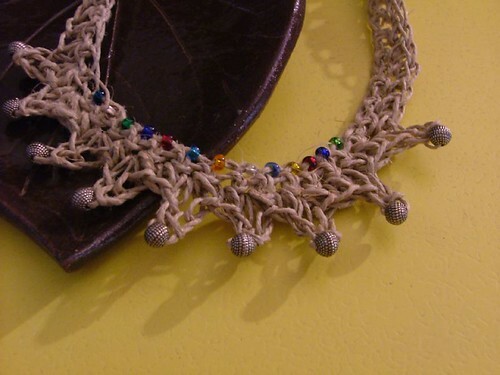 i read an excellent tutorial on the online magazine crochet me, and found myself super inspired to make some neck-laces. i love crocheting, mostly because i’m pretty fast, so things go bouncing along, and then i’m enjoying the product rather than endlessly creating and eventually getting impatient and giving up. i had never tried beaded crochet, and i found it to be very accessible and easy to get the hang of- you certainly lose some of your rhythm, but it seems to be worth it for a small project like this. 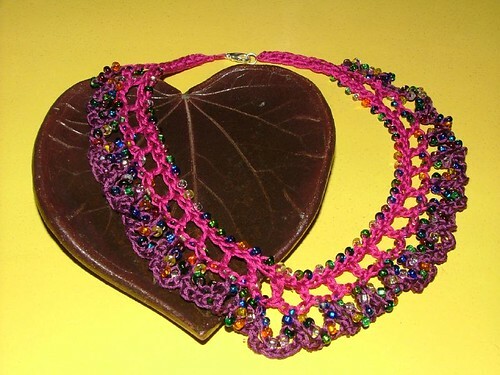 i don’t think i’ll be making any beaded crochet bags any time soon, but i think these necklaces are the ideal size for this technique. the first example is the necklace i made for my three year old, sage. she chose the beads on this after i had chosen the floss (embroidery floss, as i have no crochet cotton in the house at the moment). she has a wonderful sense for color, i think. 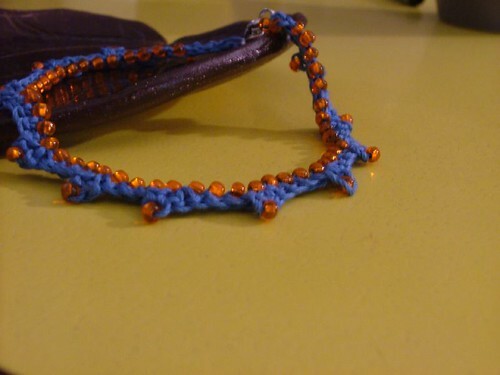 this one is very small and simple, since i knew she would be twisting and turning it, tugging, etc. it looks so cute on her- i’ll attempt to get a photo of that later, when she’s awake. this one is of hemp, with rainbow-colored glass beads and silver tone rounds. it’s a little stiff, but again, i thought i’d use what i had for the prototypes. so, my dears, would you wear a design like any of these? would you prefer something simple, or more ornate? what would you think would be a fair price for a handmade piece like this? please comment with your thoughts, and thanks in advance. now, back to your hot dogs and fireworks. have a beer for me!